A survey answered by 189 maintenance technicians working for LATAM Airlines in Peru, Brazil, Paraguay and Colombia has identified for the first time the potential impact on flight safety of changes in maintenance procedures, reductions in personnel, and the replacement of expert workers by less qualified staff. Trade unions gathered in the ITF LATAM network, which represents 23,000 LATAM Airlines workers in seven countries, state that the data revealed by this survey is even more important at a time when the company is operating at full capacity during the Olympic Games in Brazil, increasing traffic by more than 300 additional flights. According to figures reported by Latam Airlines, in a period of 12 months 996 people working in maintenance were laid off – that is 14.25% less provision for the same or increased air traffic. 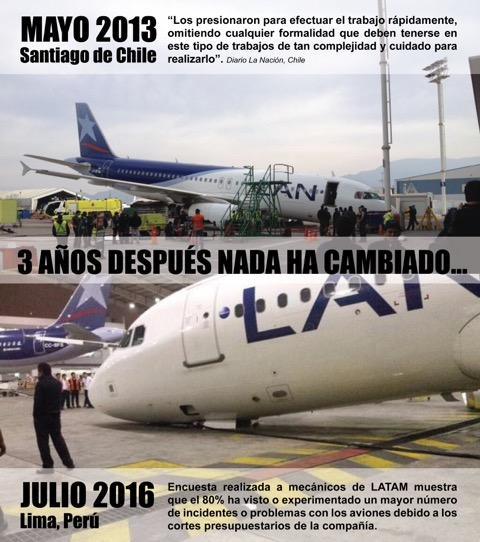 In the last three years, 80% of maintenance workers at LATAM in Peru, Paraguay, Colombia and Brazil have seen “a greater number of incidents or problems with aircraft due to the company’s budget cuts.” 34% report having received “pressure to finish work at the expense of quality and/or safety” on flights, and 23% have experienced increasing “fatigue and tiredness due to the large number of working hours” – flagging a warning light over the cuts and the implementation of the company’s ‘Simplicity’ and ‘MAR’ (Mantenimiento a Requerimiento) adjustment programmes. The survey (attached in Spanish) was carried out at the request of the trade unions of aeronautical technicians grouped in the ITF (International Transport Workers’ Federation) LATAM network, with the aim of identifying the areas of greatest impact produced by the changes in procedures, new programmess and budget cuts that LATAM Airlines is implementing in each of the countries where it operates. These have led to the repeated warnings made by workers to the company and its chief executive, Enrique Cueto, to whom the unions of the region sent a letter asking for a meeting to explain their concerns. So far there has been no response. Workers in Peru, Colombia, Brazil and Paraguay have come together to identify what they believe may be a general policy of LATAM, in order to save money, of refuelling aircraft with passengers on board without the a technician certified in that procedure being present. 86% of respondents believe that this practice seriously increases the risk for both crews and passengers. Among the most worrying results, workers in charge of making the technical procedures for the fleet of LATAM Airlines consider that the loss of qualified personnel generates pressure on their workload as determined by their superiors, with negative impacts on their quality of work and the safety of flights, resulting in a potential threat to crew and passengers. 26% of workers state that in the last three years in their workplace they have seen “delays and cancellations of flights due to lack of licensed technicians and sufficient aeronautical experience.” Similarly, 31% of respondents stated that they have seen a decrease in the number of licensed technicians and 34% have seen a reduction in the number of experienced technicians. The company has developed new policies and operational procedures aimed at budget cuts that are directly affecting maintenance technicians inall countries. These are programmes labelled by the company as MAR (Mantenimiento a Requerimiento), and Simplicity, which moves the operations of each country, including maintenance, to Chile, removing the control and monitoring of the original operator. This programme also includes Remote dispatch, which involves despatching an airplane remotely from the place where the flight originates. 81% of respondents believe the MAR programme could adversely affect the safety of passengers and crews. 57% believe that the Simplicity staff and cost reduction programme will also have negative effects. This is the result of policy changes that do not consider the expert voice of those operating those who carry out operations. To the question of whether in the last three years they have experienced “confusion from frequent changes in policies and procedures”, 48% responded affirmatively, while 29% have faced “unilateral changes in company policies that compromise the quality of work “. Aircraft maintenance procedures are regulated by the aviation authorities of each country, but 58% of specialists said that there has been an incresase in the number of licensed technicians replaced by unlicensed ones. • 66% have experienced pressure to quickly finish maintenance work at the expense of the quality and safety of work. • 52% have received instructions and pressure to sign a job on behalf of a third party without having verified it. Since 2012 workers in the region request a meeting with the highest authorities of Latam Airlines. We insist on applying this meeting and permanent interest in collaborating.